How many countries begin with the letter Q? The Answer – just ONE! and YES I have been to this country too! I had the opportunity to go to Qatar pronounced ‘Cutter’ or ‘Ka-TAR’ as the chaperone for the Girls’ Varsity Soccer Team from UAS – Universal American School Kuwait. 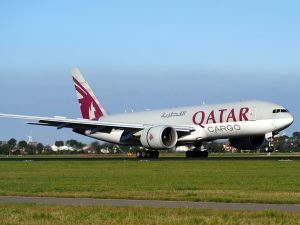 To travel to Qatar one must fly. Qatar is important as a trade bridge along the Persian Gulf. 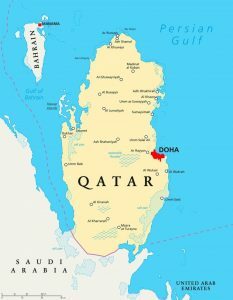 Qatar shares a border with Saudi Arabia and Bahrain lies in the Gulf between Qatar and Saudi Arabia. 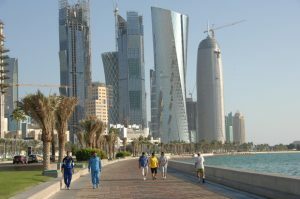 The country is mostly desert but many of the population of 2.6 million live in the now modern city of Doha. 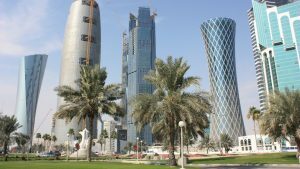 Doha is a mixture of old and new. Close to Doha is Education City, where we were staying with teachers and coaches of the host school. 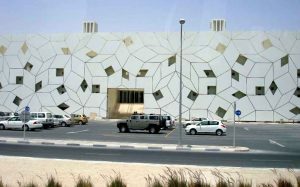 Education City covers 14 square kilometers and houses educational facilities from school age to research level and branch campuses of some of the world’s leading universities. The students were billeted with students from the school hosting the soccer tournament. Here is the LAS building of the Education Complex in Education City. 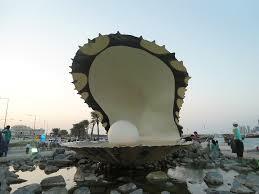 The land of Qatar was once famous for its pearl diving. I remember seeing this or one similar when we drove along the corniche. 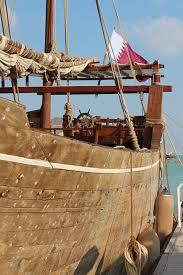 Pearl Divers would travel on these traditional sailing boats called Dowhs. As part of our trip here, the students were taken on a boat ride from the harbor in Doha and had the opportunity to enjoy an adventure on one of these dowhs. We also had a chance to visit the souqs in the old city. 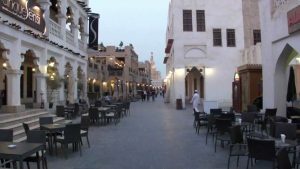 This is the Souq Waqif Walking Street in Doha Qatar. 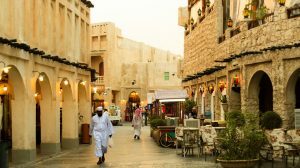 The people were very friendly and we enjoyed our trip to this thriving country located in the Persian Gulf. Be sure and catch the next episode of the Traveling Tuesdays Series as we travel to a country beginning with the letter ‘R’.